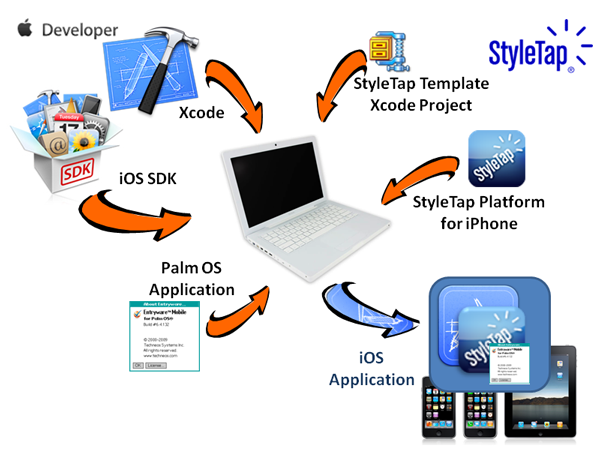 StyleTap iOS® Wrapper SDK enables you to deploy many of the 30,000 mobile applications written for Palm OS as iOS applications that run on standard Apple iPhone, iPad or iPod touch devices. Why Use the iOS Wrapper SDK? StyleTap Platform for iPhone® cannot currently be purchased through the Apple App Store because it provides capabilities (e.g. the ability to download other Palm applications) that are restricted by Apple. The StyleTap iOS Wrapper SDK allows you as a Palm application developer to create an iPhone (iOS) application that "wraps" a Palm application inside StyleTap Platform for iPhone in a way that removes all of the restricted capabilities. You can then submit the resulting iPhone application to be included in the Apple App Store. Similarly, if you are a large organization that doesn't care about the App Store but wants to deploy your key Palm OS applications onto internal iOS devices, the StyleTap iOS Wrapper SDK can help. It enables your required Palm application(s) to be embedded into an iOS application that can be installed internally on standard Apple devices, without going through the App Store. From Apple: Your organization must belong to either the Apple Developer's Program (if you want to submit to the App Store), or to the Apple Enterprise Developer's Program if you want to deploy strictly internally. From the Apple developer website, you must download the iOS SDK and Xcode to an Intel-based Macintosh development system. From StyleTap: You will download a template Xcode project, that includes the version of StyleTap Platform for iPhone for use on non-jailbroken devices. Also included is a document outlining the configuration choices needed for internal use or for applications to be submitted to the App Store. From Customer: You will insert the Palm application (.prc and .pdb files) and your StyleTap license information into the StyleTap Platform configuration within the Xcode project. Finally you will build the Xcode project to generate the iOS application. If you haven't tried your Palm application on an iOS device, you can download a free 14-day trial of StyleTap Platform for iPhone (or purchase a copy) and install it on a jail-broken device to evaluate the functionality. If you are an iOS developer, you can download documentation and SDK template.